Steve Bannon, the man who Lucifer says “gives me the heebie-jeebies” and Hitler’s ghost deemed “a little too racist for me,” will no longer serve on the most important and powerful foreign policy and security committee in the world. The Associated Post and the BBC both report that President Donald Trump has removed Bannon from the National Security Council’s Principals Committee. 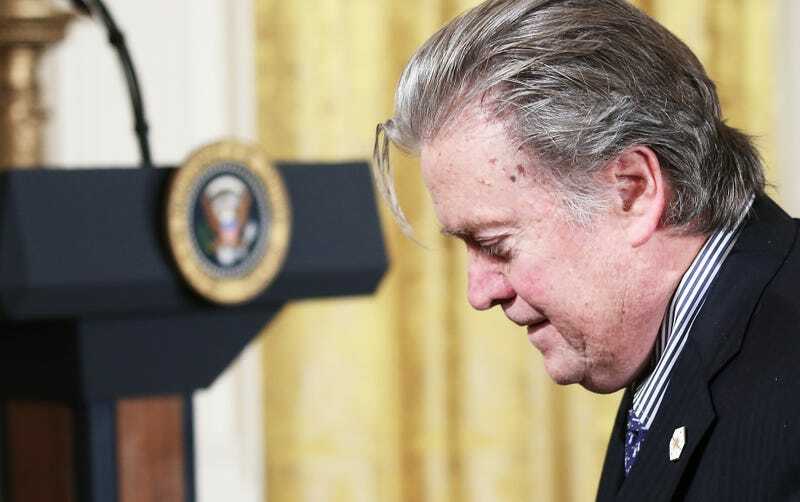 Bannon became Trump’s chief strategist after leaving his role as a founder and editor-in-chief of Breitbart News—which he lauded as the “voice of the alt-right”—to run the “Make America great again” campaign. Most political experts were stunned when the Trump administration invited the man who ran the neo-Nazi version of Facebook to join the small, exclusive group that advises the president on military strategy, foreign and domestic policy, and the security of the country. Bannon, who served in the navy for seven years, has no combat experience, and his most significant military role was reportedly “carrying messages” and writing reports.” Aside from that time he tried to start a right-wing version of Breitbart in India, the White House chief strategist has no foreign or domestic political experience. The NSC is usually made up of the president, vice president, secretary of state, secretary of defense and secretary of energy, the chairman of the Joint Chiefs of Staff, and the director of national intelligence. The president adds other advisers at his discretion—usually Cabinet members or policy officials. The Principals Committee is basically all of these people minus the president and VP. Trump made history when he removed the chairman of the Joint Chiefs of Staff and the director of national intelligence from the committee and found a loophole to replace them with Ku Klux Bannon without Senate confirmation. Bloomberg News reports that national security adviser H.R. McMaster made the change with Trump’s blessing. Bannon will continue to serve in his role writing xenophobic executive orders and finding ways to antagonize immigrants.